Events include an open house beginning at 3:30 p.m., a dedication ceremony at 4:30 p.m., and an exhibition featuring former touring tennis professional Todd Martin. The public is invited to all three of the events. Admission is free. The 12-court, outdoor Vande Poel-Heeringa Stadium Courts are part of the Etheridge Tennis Complex at the college’s Ekdal J. Buys Athletic Fields, and are located east of Holland Municipal Stadium. The $2.2 million facility, which also includes elevated seating for spectators, is designed for competition, instruction and casual play alike. In addition to providing a first-rate home for intercollegiate competition, the stadium courts serve as a resource for the entire community. 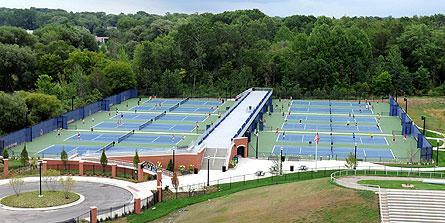 Just hours after opening in June they hosted the local qualifier camp for high-school-level district United States Tennis Association (USTA) competition, and across the summer were home to the college’s nine-week Tennis Academy, which instructs young players spanning kindergarten through 12th grade. Not least of all, they are open to those simply looking for a place to play a game themselves. The Vande Poel-Heeringa Stadium Courts were made possible through many generous gifts, including from the families of Earle Vande Poel ’35 and George Heeringa ’36, for whom the facility is named. Doubles partners on the Hope College tennis team, both men went on to careers in business, Earle at American Seating Co. in Grand Rapids, where he headed the company’s church furniture division, and George at Hart and Cooley in Holland, from which he retired as president. The naming of the Etheridge Tennis Complex, which also includes the college’s indoor, six-court DeWitt Tennis Center, recognizes the generous contribution of the Barb ’73 and Ted ’72 Etheridge family and their passion for tennis which inspired and facilitated the design. Their support in turn expresses gratitude for the influence on players and contributions to Hope tennis made by Jorge Capestany and the late Karen Page. Capestany, who is manager of the DeWitt Tennis Center and founded the Hope Tennis Academy in 2004, is a nationally respected tennis professional, and is one of only 10 people world-wide that is a Master Professional with both the United States Professional Tennis Association and the Professional Tennis Registry. Page had an extensive background as a teacher and coach of tennis, including as coach of the boys’ and girls’ varsity teams at Holland West Ottawa High School, was director of the DeWitt Tennis Center and had coached the Hope women’s tennis team for 12 seasons before her untimely death due to cancer on July 3, 2009. Signage at the stadium also recognizes the support of the many others in the community and among the college constituency who provided financial support to help make the stadium courts a reality. The project has been completed through the college’s $175 million “A Greater Hope” comprehensive campaign, which was publically launched in October 2011. The hour-long open house on Saturday, Sept. 22, at 3:30 p.m. will show the courts in action with demonstration games by a variety of local players. In addition, Martin will be available to sign autographs. The 4:30 p.m. dedication will include remarks by speakers including Dr. James Bultman, president of Hope College; Kurt Dykstra, mayor of Holland; Ted Etheridge; Paul Lubbers, a 1983 Hope graduate who is director of coaching education with the USTA, which provided a grant in support of the stadium courts; and Eva Dean Folkert, assistant professor of kinesiology and co-director of athletics at Hope. Capestany will serve as master of ceremonies. The 5 p.m. exhibition featuring Martin will include doubles play with Matt Bradley, Adam Ford and Nate Price, all of whom are tennis professionals on the staff of the DeWitt Tennis Center; Price is also women’s tennis coach at Hope. Martin was once ranked fourth in the world, and has received honors including being named the 1999 “Male Comeback Player of the Year” by Tennis Magazine, the 1993 and 1994 “Adidas/ATP Tour Sportsmanship Awards,” and a 2002 “Jean Borotra Sportsmanship Award.” He is the founder of the Todd Martin Development Fund, which provides tennis and leadership programs to at-risk youth in Lansing and surrounding areas. Born in Hinsdale, Ill., he and his wife and children live in Ponte Vedra Beach, Fla. He also has a Hope connection: a sister, Amy, who graduated from the college in 1989. The new facility supports a sport with a long history at Hope. The first men’s tennis match with an outside opponent occurred in 1916, against the Grand Rapids YMCA. Tennis is Hope’s longest-running intercollegiate sport for women, played in a co-ed format when in 1921 Hope men and women participated in a six-team tournament in Kalamazoo. In the first half of the 20th century, the college had its own courts in two on-campus locations: southeast of Lubbers Hall; and where Dimnent Memorial Chapel, built in the 1920s, now stands.